This Detroit group was lead by the dynamic Charles Beverly whose subsequent solo recordings for Mainstream in the 70s and Gino’s in St Louis in the 80s are very good indeed. Not so sure about his Torrid releases later though. In any event while I like the Final Decisions releases for Bumpshop and Love being a big fan of sweet soul (“Hour Of Your Need” is a particularly good ballad) they are not really suitable for inclusion here. However the flip of the dancer “You Are My Sunshine” certainly is. 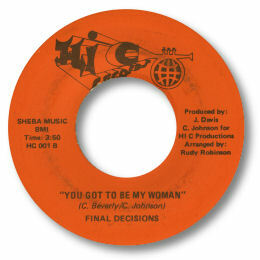 You Got To Be My Woman is a powerfully persuasive impassioned plea with Beverley giving arguably his best ever vocal performance over a gently tugging harmony background and suitably dramatic orchestral arrangement. His falsetto verses and breathless ad libbing over the chorus confirm his status as a singer of both ability and authority. UPDATE ~ Bob Abrahamina has written to say that there is an issue of the Bumpshop 45 with "The Pusher" on the flip side - this 45 has the same number as the one shown in the discography below. Thanks to Bob Abrahamian (see Links) for the extra info.